The word "intimacy" has a broad range of meanings, referring to familiarity with a person, place, thing, or even a time in history. In this blog, I'll focus on intimacy in our personal relationships. A common misconception is the belief that we have to know someone well to regard the relationship as intimate. Otto Frank, Ann Frank's father who discovered her diaries and had them published, realized how little he knew about his daughter. Here are his words, "I must say, I was very much surprised by the deep thoughts Anne had. It was quite a different Anne I had known as my daughter ... And my conclusion is, since I had been in very good terms with Anne, that most parents don't know really their children." The antithesis of intimacy is the need to control the other. Often this barrier to intimacy stems from fear and can be explored -- in therapy or in other ways -- with positive results. Crises of intimacy offer fertile land for growth. This occurred in the K. family. When Ms. K returned to college, her husband objected; she was no longer available to cook dinner and care for their son after school. She encouraged her husband, who worked at home, to adjust. A year later, he realized that he'd benefitted. He'd learned to cook and liked it, and he deepened the bond with his son. On my visit to Japan about ten years ago, I heard about the cultural marital crisis. Husbands were retiring and expecting their wives to cater to them all day long. But the wives, accustomed to having their days free, objected. If they wanted to stay happily married, the husbands had to learn to take their wives' needs into account. As a result, the relationships became more intimate. 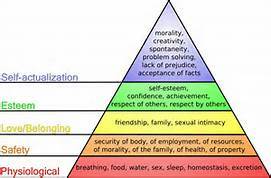 Degrees of intimacy can be superimposed on Maslow's hierarchy of needs. On the basic level, we gratify creature comforts -- the physiological needs for food, water, warmth and rest. Next comes the need for safety and security. Farther up the ladder is our psychological need to belong and have friends and relationships and above that, are feelings of esteem, prestige and accomplishment. The top rung brings self-fulfillment and self-actualization with the achievement of our full potential, the ability to create in a given field of endeavor. In my blog of December 14, 2015 (Gratitude for Our Times (& a Peek into the Life & Times of Rose Kennedy), I compared Rose and Joseph Kennedy with the power couples of today. Rose lived in a patriarchal society and her husband, Joseph, dominated the family. Today's power couples, like the Gateses and the Zuckerbergs, have an equal, collaborative partnership as they work on their creative and philanthropic endeavors. Conclusion: We have progressed to expect caring, cooperation, and collaboration in our intimate relationships.